It had been some time since he'd been led to such a large portion of the stalwart Autobot's essense. But according to his scannors, the City computer fairly screamed with it. At some point, probably recently, an entire copy of Optimus Prime had been downloaded and run. For what purpose, he had yet to determine. Unthinkable. Just as the High Comand's decision had been to finally, permanently remove Hi-Q from the interior of their most heroic leader. It wasn't without a hint of malice; after all, it would not due to infect such a high- ranking being with the stench of organics... never mind that those very same organics had saved Prime on no fewer than two occasions...! Well, he was never quite the same. Hi-Q: "Ahh, here it is." He reached into a console and ejected the large disk from inside it. Though old, and worn, the name 'Optimus Prime' could still be read on its label. This was obviously the same disk that had Bumblebee had brought with him to Nebulous those years ago... and had set Hi-Q upon the path he was now on. Still, that was not his way. Not the Autobot way. And like it or not, human or not, Hi-Q still considered himself an Autobot. He wondered how much organic material was left inside of him... inside of any of them, for that matter. His was a long and rich life, but what about the other humans and nebulons who underwent the Master Process? What would happen when they realised they were well and truly trapped with their extra cybertronic parts? How did they go on living? But, it was best not to dwell upon it. The Mission was most important. Storing the disk within an armored pocket, he then began the process of determining if there were any other traces of Optimus in the systems. And indeed, there were. The City program itself had been enhanced, overwritten as it were, by the contents of the disk. Well, that wouldn't do. He didn't have the power to move the entire City. He'd have to download the City computer into a new structure, something more portable. Hi-Q had just the thing. During his studies on Cybertron, he'd discovered an exoframe type which suited his needs quite well. It was small, portable, and had the ability to store massive amounts of data, just what was called for here. The frame type was called a scrounge unit. When he'd adapted the design and started using it in his work, a number of the Autobots had been angry at him, Blaster most of all. They wouldn't say why, though, they merely stopped talking to him. Which suited him just fine. He never gave it a further thought. The design had been modified from its original. It sported 3 integrated wheels now, instead of just one, greatly enhancing its balance over terrain. Bringing one from his ship, he made the necessary connections to the City computer. A switch was thrown; massive amounts of data poured into the Scrounge unit as the City computer was downloaded. Silence; the City monitors grew dark. Another moment, and the eyes of the scrounge unit glowed with power and purpose. WannaBee hadn't the desire to deal with another of Hook's speeches at the moment. He was angry, and rightfully so; he'd spent a considerable amount of time building up his courage ("their courage," he reminded himself) for this meeting. Hook: "What, an apology? How droll." WannaBee: "I've seen the records. Restored portions of our fragmented memories. You tinkered with us from the get- go, and all to protect your precious secret pact with the High Command!" Hook: "I did no such thing. I adjusted your perceptions so as to allow myself a moment of peace on this mudball planet. You keep interrupting that." WannaBee: "What about the others? Do you adjust the memory engrams of your own team?" Hook: "No, of-course not. They choose to follow the rules and stay here. It's you and your team that keep going out into public, trying to right wrongs and fight the good fight. We've been over this. In order to operate outside, you agree to a memory wipe. Then when it comes back, you come here all pissed at me, as though this were somehow my fault. I tell you, I'm quite sick of this. We need a permanent solution." Well, this was even worse. There wan't even room for a 'bot to turn around in, so tightly packed were the human ground transports. If Steers had to guess, this location had even *more* humans than the last one. Steers sat in the parking lot for some time and pondered the situation. He was starting to wonder about this wild goosebot chase. After all, the Dairycons already had a preferable location for their base- and if it came down to it, they always had the shuttle. Seemed to Steers that the whole purpose of 'looking for a new location' was more about scouting the planet they were here to protect; learn more about her and her inhabitants. He'd read the mission briefs, about how they'd brought their war here to earth, and thus how it was their responsibility to ensure the safety of its inhabitants. Maybe this was how they ended up bonding to it. Based on a bot's interest, a 'scouting misison' was assigned. That son of a scraplet. So that's what he meant by 'scout around'. OK, OK, he got it. Mission complete. Steers would have to slap someone on the side of the cranuim when he got back. Steers: "This is Steers, calling the Shuttle. I'm ready for transport back. Misison complete." Steers tried again. "I say, y'all got yer ears on? I *said* this is Steers. Mission accomplished. One to return. Respond, ya long eared galoots." The comm crakeled to tlife. But it was not the call he was expecting. "Foolish little Dairycon, there is no help for you." Steers: "What the? Who is this!?" "All you need to know is that the shuttle is gone, and you are all all alone. Of no consequence. Left behind because you couldn't possibly matter." Steers: "Come say that to my face, Pilgrim"
"Goodbye, Steers. May you rust in peace on that mudball you call a planet." The comm cut out, and Steers was again left in silence. Then deciding, to spark with that, he activated his comm. "We'll see just how 'alone' I am on this planet", he thought. Thumbing the controls, hijacking earthen satellites, he sent out the highest call of all -an A1 Priority Distress signal. The transmission held for only the highest of emergencies. *Every* earth-bound, space-bound, solar-system- bound Transformer would pick up this signal, and as required by Pax Cybertonia be required to respond. The signal sent, Steers closed his comm. He had work to do. He had friends to find. He would not be left behind. He would make whoever did this kiss his skidplate. ElCowmeno poked thru the remains of the underground base that once served the Dairycons. He was appalled; obviously, a battle had been fought here long ago, and probably lost. He wondered, then, if that was the reason for abandoning the base? He had no other answers. Scanners had indicated a recent incursion into the ruins, but even that was some time ago, and the intruder had left no trade. Feeling this was a dead end, ElCowmeno pondered. It was his responsibility to return the Mexicons to Mexico, and for the bulk of his people he'd done just that. In memory of Nachos BelGrande, then, why was he poking around here? In something that was probably not his business? Beause he felt it was the right thing to do. His Lieutenents sensed their leader's frustration. They had volunteered to stay behind with him, to protect him, so that he might return to the glorious homeland and rule his people in peace. The fact that he was so restless now was of some concern. DingBat: "The leader is frustrated. He should return home, yes yes?" FlipOff: "Shut *up*, he'll hear you." DingBat: "You sound frustrated too, hmmm?" He did. Straightening up, ElCowmeno took in the full breadth of the signal. His spark told him *this* was the call they'd been waiting for. He felt it... nay, he knew it. ElCowmeno: "My beloved Mexicons, Transform and Roll out!" The call came thru before he could throw the first punch. Hook: "It's a signal, probably from one of the fellows you're looking for. Or maybe it's a trap. I don't care. We're not going." WannaBee: "The hell we aren't! The signal is directing us to a precise set of coordinates that's within the borders of this fleshlings designated state. We are *required* to go!" Hook: "Hmph. Leave it to you to think something like that." WannaBee: "Like it or not, you're part of this team too. Assemble everyone. We're going." Hook: "We're not exactly designed to travel covertly." WannaBee. "You don't understand. I said to *assemble* everyone." Hook: "You can't be serious. How I detest that." WannaBee: "You made your choices. Now I have to make mine." Hook: "It's not our concern. We're not part of this." WannaBee: Well... I just made us part of it." Hi-Q: "Yes, well, jolly good and all that.... are you the City computer?" Hi-Q: "Any difficulty adjusting to this new form?" BiG Max: "Negative! This unit will allow Big Max mobility while the City form recharges!" Hi-Q: "Are there any others I should be concerned with before I go?" Big Max: "Affirmative! Multiple Reinforcement units remain on Standby to defend the City. Multiple units remain in emergency stasis within the controlled area of the City!" Hi-Q: "Ugh.. can you possibly talk *without* yelling? We're not announcing ourselves in the midst of an epic battle, you know." Hi-Q pondered. His primary objective was completed; he'd retrived two aspects of The Prime. Although the City structure istelf could be considered an aspect, without the cental City intelligence running it, it remained a periphal component at best. It would be a long time before power built up enough to allow it movement again, and that would be a time well past what Hi-Q expected to live. Still, he couldn't just leave. If there were still injured 'bots contained within the City, it wouldn't be fair to leave them here without the City intelligence. If something went wrong with their stasis, there wouldn't be a City computer here to take remedial steps; essentially, he'd be consigning them to death. That didn't sit well with him at all. He spent his existence saving lives, no matter the cost. Hi-Q: "Can any of the stasis units be made operational?" Big Max: "Affirmtive! With existing facilities, One. The rest would have to remain here in the City!" Hi-Q: "Sigh. One out of so many? That's not helpful to my mission." Big Max: "Are we going somewhere?" Hi-Q: "Very astute. You're acclimating well to your new frame. And yes, I am on a mission. One that would probably be facilitated by having some working 'bots. Especially those containing the essense of The Prime. You contain his essense. You will come. Do any of the others?" Big Max: "Affirmative!" The City lit up a screen; two of the worker units were bringing a stasis pod to the main chamber. Hi-Q: "One of the deceased, I take it?" Big Max: "Affirmative! You will restore him to function! He will recieve the essense! He will aid you in your mission!" Hi-Q took a moment to let that sink in. Well... that would be one way to solve the problem. Big Max: "Affirmative! This unit's life for another! No nobler a sacrifice!" Hi-Q: "You are too good for them, you know." The signal was sent. The others were on their way. He'd recieved confirmation from no less than two team leaders. They'd band together. They'd find out why the shuttle disappeared. Leadership might be a thorny issue. They'd solve it when they got here. For his druthers, Steers figured a 'bot had to do what a 'bot had to do, and he'd tell them that. He heard the rumble of engines in the distance. The time drew near. Steers transformed. 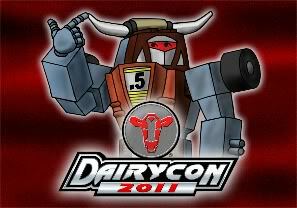 Whoever these new recruits were, he'd show them what it meant to be a Dairycon. Whoever took his friends would pay. "Reinforcements are on the way, Pilgrim. Sit tight. Stay online. We're coming." "Yes. The ship and its occupants have been... diverted." "What about the ones left on Earth?" "They are of no consequence. We'll have our Agent dispose of them at his leisure." To Be Continued in the upcoming Saga, "Changing Steers: The Adventures of Tarmac !"